My dear friend Robin posted some of the books she read in 2010. (The short time she needs to get through a book is incredible. I’ve known her to finish dense academic tomes in the time it takes me to read the first hundred pages.) Well, her list reminded me of something. One thing I made a concerted effort to do this year was to read more. You see, after my time in grad school, where we were reading 3-4 books a week for classes, I lost any interest in reading. And for someone who, growing up, saw the library as a second home, this sucked. Well, time heals all wounds — even the ones perpetrated by graduate school. And this year, my love of reading returned in full form. 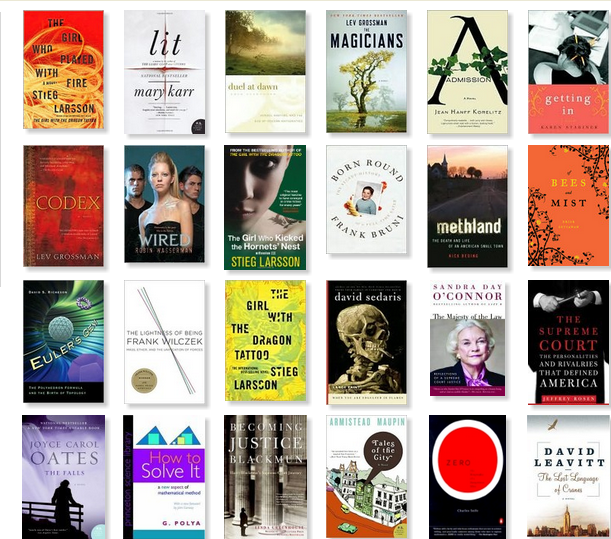 I’m not a fast reader, but I was proud of the number of books I went through this year. Like her, I’m going to post them. I’m pretty sure I read these books this year, but one or two might have been from 2009. (The site I used to track my reading is nicht so gut.) They aren’t in any order. I also purchased a bunch of books which I haven’t read yet. So here’s to hoping I can continue the trend in 2011. Sam, I’m so glad to hear that your love of reading has returned! I went through something similar a while back and also found that time heals all wounds. Hooray! May your new year be brimming with excellent reading! I was using Living Social’s “Visual Bookshelf” which sucked. So right before making this post, I exported all my books to GoodReads (http://www.goodreads.com/) and it does that beautiful image!